It’s not that I dislike doing laundry in theory. It’s just that I have to go down three flights of stairs and then three (or five) blocks to the laundromat, depending on whether I go to the really big one farther away or the tiny one that is closer. It takes serious effort in all kinds of weather. The kind of effort I only feel like making once a month. Last year I busted my cheap wire cart when going down the last set of steps with a particularly unwieldy load of laundry. 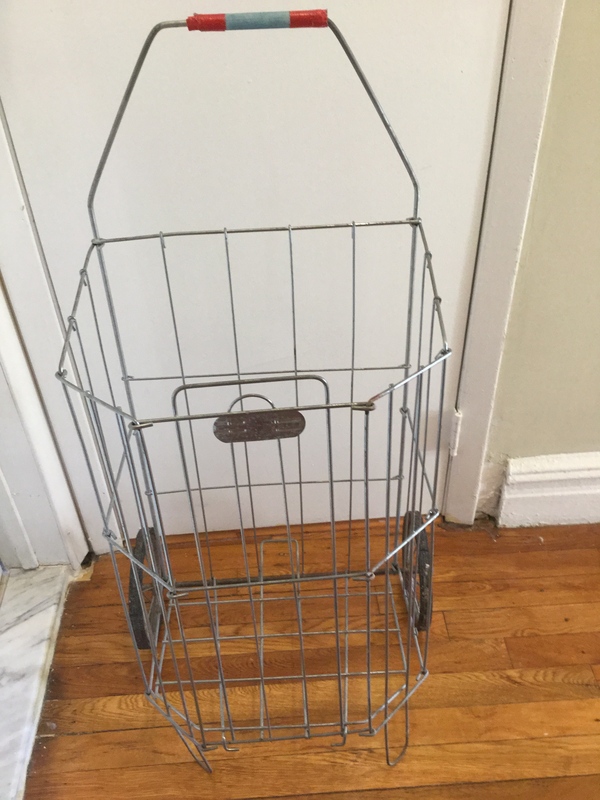 Imagine my surprise when a few weeks later, I discovered this charming collapsable wire cart at my favorite lunch-time vintage shop. Although the label is long gone, it is probably a mid-century “Go Buggy” manufactured in Philadelphia by Dennis Mitchell Industries. One of their models was called the “Pres-toe.” I did a quick repair job on the crumbling blue rubber handle by using some red duct tape. This little cart is so cute, I kind of sort of don’t mind doing laundry as much. And it’s smaller than my last one, so I am not tempted to overload it. Yet.